The Rt Hon. 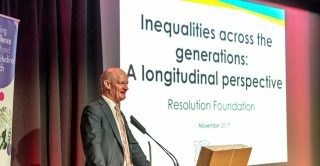 Lord David Willetts gave the keynote speech at the 2017 CLOSER conference on 1 November. Here, he explains how longitudinal analysis helps us expand our understanding of intergenerational differences and where policy to address these might focus. Younger generations are currently experiencing work uncertainty, slower pay progression, and are finding it more difficult to own a house compared to their predecessors. When I wrote The Pinch seven years ago it was the first book looking at Britain from the point of view of the different generations. Since then, a consensus has built on the unique challenges facing today’s younger generations when compared with their parents. And far from reflecting some sort of intergenerational warfare in which different generations’ interests are pitted against one another, polling for the Intergenerational Commission that I chair has shown that these worries spread across the generations. Six-in-ten UK adults agree with the notion that every generation should have a higher standard of living than the one that came before it (less than one-in-ten disagree), and this sentiment is shared by millennials and baby boomers alike. Importantly, while people across generations view generational living standards progress as a principle underpinning society, only a minority believe that this generational progress is still taking place for young people today. The pessimists currently outnumber the optimists by 2:1. Economic analysis for the Intergenerational Commission has established that the pessimists aren’t wrong. When looking at pay trends, we have found that millennials born between 1986 and 1990, now in their late 20s, are earning no more than their predecessors did when they were the same age 15 years ago. These dismal outcomes are compounded by housing trends which show that young people today typically need to save for around 19 years for a deposit on their first home. In the late 80s the figure was just two years. This has led to lower levels of home ownership, with millennials half as likely to own homes by the age of 30 as baby boomers were, and four times as likely to be renting privately. This has meant a huge increase in housing costs across generations, and – alongside shifts in the pension system away from generous final salary schemes – much lower levels of wealth accumulation within younger cohorts. This evidence is shocking and has captured the attention of politicians across parties. But the aims of the Commission extend beyond merely establishing that generational living standards progress has stalled. What we really want to do is to understand what lies behind these trends and how we can prevent a further deterioration in young people’s prospects. This is where longitudinal analysis plays its vital part. Longitudinal analysis has helped us shed light on why young people are earning less than their predecessors at the same age. Tracking employees over time, we have found much lower levels of job mobility amongst the young, with millennials around 25% less likely to move from one job to another during their 20s than generation X were. Since moving job is a key means through which people improve their pay prospects – particularly when young and finding one’s feet in a career – this lack of mobility is a big reason why young people’s wages are underperforming. We worry that these effects might follow the young into the future, pinpointing an important area on which policy to improve wage prospects needs to focus. Another area in which longitudinal analysis has bolstered our understanding relates to the drivers of cohort wealth growth. Our exam question was whether the increasing concentrations of wealth within older cohorts had been driven by ‘active behaviours’ – such as buying a home, paying off debt, or accruing pension rights – or ‘passive changes’ driven by external forces like house price growth. Using longitudinal survey data we can separate these active and passive drivers. We found that four-fifths of families’ housing wealth growth since the early 1990s was driven by the house price windfall, and three-quarters of pension wealth growth since the mid-2000s by shifting life expectancies and by interest rates inflating the market value of final salary pensions. In both cases, adults born in the 1940s and 1950s were the big beneficiaries of these windfalls. This is an important new perspective for thinking about how to boost wealth accumulation within younger cohorts – and the treatment of wealth in the tax system. So investing in the often-complex world of longitudinal analysis has extended our understanding of intergenerational differences and where policy to address these might focus. There are of course areas where we’d like to go further – one bugbear is that there are no datasets for tracking the transmission of growing wealth pots down generations within families. This is important as we see inheritance as the next intergenerational frontier, particularly for those interested in the dynamic relationship between inter- and intra-generational inequalities. With the political temperature on intergenerational debates rising, I hope that policy-makers and the research community can work together to protect the great longitudinal resources we have today and ensure we are developing the tools to address tomorrow’s policy debates. This blog first appeared on the LSE British Policy and Politics blog.